recently as six months, after the formal announcement had been made, no wind studies or environmental studies had been conducted. I find it hard to believe that the Orotina airport is as much of a ‘slam-dunk’ as is being reported. The latest news is that we will all know more by the end of 2017. Regardless of the real reason why the airport was never started in Osa is still up for debate today. I have spoken with Osa Mayor several times, and he is continuing to try and push the project forward. However, he understands the difficulty of getting the politicians in San Jose, four hours away, to listen. Costa Rica has once again been ranked as the happiest place on the planet by the Happy Planet Index. Here’s their scoring of Costa Rica. People living in Costa Rica have higher wellbeing than the residents of many rich nations, including the USA and the UK, and live longer than people in the USA. And all of this is achieved with a per capita Ecological Footprint that’s just one third of the size of the USA’s. Costa Rica is also a world leader when it comes to environmental protection. The Costa Rican government uses taxes collected on the sale of fossil fuels to pay for the protection of forests. In 2015, the country was able to produce 99% of its electricityfrom renewable sources, and the government continues to invest in renewable energy generation in an effort to meet its goal of becoming carbon neutral by 2021. Come on down and see for yourself what makes Costa Rica such a wonderful place to live. Pura vida! The following article is great news for everyone who owns and/or visits Las Villas de San Buenas. 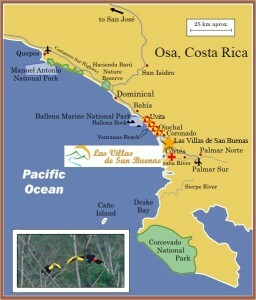 Corcovado National Park is approximately a 2 hour 45 minute drives from Las Villas de San Buenas (map). Corcovado National Park is home to 2.5% of the entire world’s bio-diversity, making the park the most biologically diverse place on earth. The Costa Rican government unveiled new installments in Corcovado National Park as part of a $2.4 million investment that officials say should help increase tourism numbers to the biodiverse jungle in the country’s Osa Peninsula. President Luis Guillermo Solís traveled to Corcovado on Friday to officially inaugurate new infrastructures located in the park’s three main sectors: San Pedrillo, La Sirena and La Leona. Workers are building a new visitor’s center in the southernmost station of Leona. In addition, there will be new bathroom stalls, showers and water treatment tanks. Leona will also be equipped with picnic areas and an electric generator as part of the latest investment. In addition to some of the new installments already mentioned, the Sirena station in the central coast section of Corcovado has received a camping platform and a common area for cooking and eating. Authorities said the improved infrastructure should not only boost the number of tourists and help facilitate the work of park rangers, but it should also give more economic benefits to locals living around the national park. Solís pointed out that his administration has continually emphasized the importance of Costa Rica’s national parks and especially Corcovado, which he said has received more than 5 billion colones ($8.9 million) in investments since Solís’ election in 2014. They are part of the Bank of International Development’s Sustainable Tourism Program, which has given some $25 million to various national parks in Costa Rica. Though Corcovado is made up of just under 48,000 hectares (about 185 square miles) of land and marine area combined, this gem in Costa Rica’s southwest corner accounts for 2.5 percent of the world’s biodiversity. Among the wildlife found in Corcovado are jaguars, tapirs, pumas, giant anteaters, monkeys and macaws.